The small Greek island of Symi, named after the nymph Syme, lies northwest of Rhodes and is part of the Dodecanese group of islands. It’s located close to the Turkish coast and several Turkish islands. The island’s coastline alternates between rocky cliffs, beaches and beautifully isolated coves, this combined with dramatic mountainous interior, make it an island most would like to discover- but few actually have. 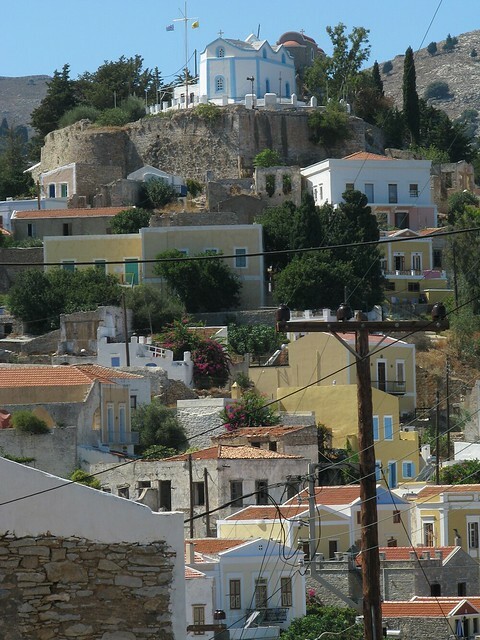 In antiquity, Symi was ruled by King Nireus who fought with the Greeks in the Trojan war. Rich archaeological evidence including the ruins of citadels confirm Symi’s strategic importance throughout the ages. The Romans took over from the Greeks, followed by the Byzantines then the Knights of St John, eventually the Ottoman Turks. 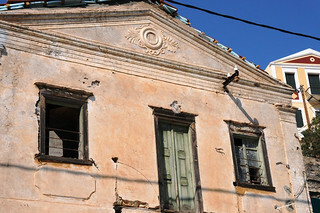 Symi only re- joined Greece in 1948, after occupation by both the Italians and Germans during WW2. Today’s Symi is characterised by many beautifully restored, typically local island-style houses, several owned by foreigners including British. The locals are mainly employed in tourism and fishing. 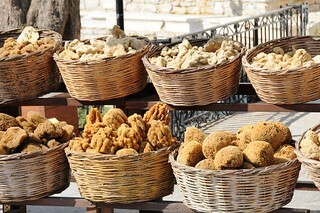 Symi is world famous for sea sponges, which the men bring from the depths by diving. The main town, also called Symi is on the northeast coast and is made up of the lower town/harbour known as Yialos and Ano Symi (or Horio – village). Another lovely town is Panoramitis, where the famous monastery of the Archangel St Michael is located, a site of pilgrimage for many Greeks who come here from all over the world. The villages of Pedi, Marathounda and Nimborio (the latter with ancient Pelasgian walls and twelve domes) are all pretty graphically Greek-islandish in style and promise a relaxing meal and wonderful views. 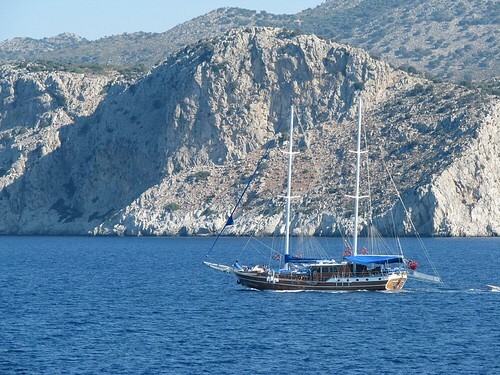 It may be very interesting to hire a boat in order to to visit either some of the island’s secluded coves or some of the nearby uninhabited islets [e.g. Sesklío, Marmarás, Gialesíno, Kouloúndros, Diavátas, Chondrós (fat guy) and Nímos.] A swim followed by a simple fish, octopus and local cheese and wine picnic there, will probably be simultaneously a simplistic and very vivid experience of a lifetime. Symi town has thirteen major churches many more chapels, some from them Byzantine in era. 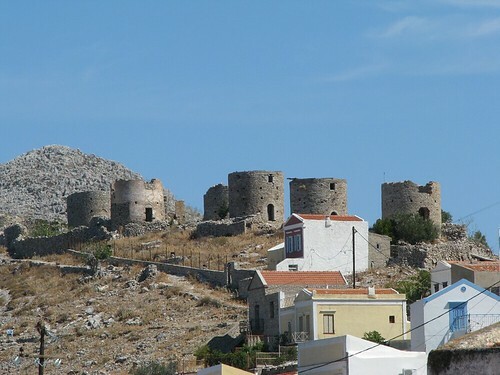 Take an evening walk to the Kastro, built by the Knights of St. John and overlooking the main town and harbour. The harbour War memorial is made up of a monument called “the Dove of Peace” in front of a Trireme (ancient Greek war ship) sculpture. 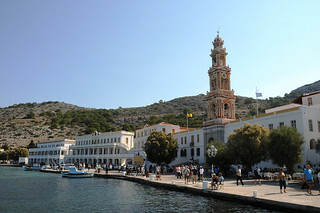 The Symi Festival during the months of July to September attracts many Greek musicians who provide free open-air concerts in the main square of Yialos and also showcases many typically Symi island dance and theatre events.